VOICE OF CHANGE: Princeton University crew coach Greg Hughes instructs his rowers in a training session last spring. Last Saturday, Hughes guided the Tiger mens heavyweight first varsity to a win over Georgetown in his debut as new head coach of the program. 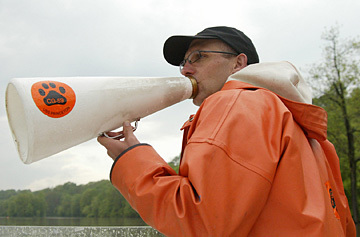 Hughes is a veteran of the Princeton rowing scene, having starred for the Tiger lightweights in the mid-1990s before serving as freshman heavyweight coach and mens lightweight head coach. He took over the heavyweight program last summer after the retirement of longtime coach Curtis Jordan. A 4-18 record may not sound like progress but posting that mark last spring represented a step in the right direction for the Princeton High baseball team. The win total quadrupled the programs output in 2008 when it suffered through a 1-22 campaign. As he returns for his second year as the PHS head coach, Dave Roberts believes that there is a comfort level that should result in more improvement.